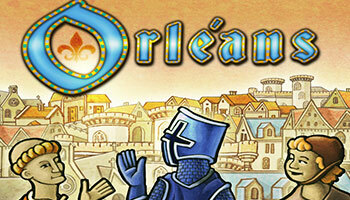 Official Site: Orléans -- Homepage on DLP's website. Each player takes: 1 Followers Bag, 5 coins, 1 Player Board, 10 Trading Stations, 7 markers (wooden cubes), 1 Merchant Token and 1 set of Followers (a farmer, a Boatman, a Craftsman, and a Trader). When the "Pilgrimage" event is drawn, you may not recruit Monks this round. Pilgrimage is the only event that is not triggered in Phase 6: "Event", but in Phase 5: "Actions". You receive a number of coins equal to your Development Status.